If you’re looking for a neighborhood with great amenities and easy access to downtown Salt Lake City, the People’s Freeway neighborhood is a perfect fit. Defined by I-15 on the west and State Street on the east, People’s Freeway spans 16 blocks from north to south and borders some of the most bustling areas in the city, but even within the neighborhood itself, residents will find plenty to love. The cost of living in People’s Freeway is just slightly lower than the Salt Lake City average. While typical home prices and monthly rents are reasonable, there’s not a whole lot to choose from; People’s Freeway is made up mostly of commercial property and features a small pocket of single family homes, along with various apartment complexes. About 75% of neighborhood households are renter occupied, with the remaining 25% claimed by homeowners. The neighborhood’s affordability draws in many young, single people, though there are a good number of families in the neighborhood as well. As is true with most Salt Lake City neighborhoods, People’s Freeway residents tend to commute by car rather than ride a bike or use public transit. However, those who prefer public transit are in a prime spot for it; the TRAX system that connects many Salt Lake City suburbs stops at Ballpark Station, right in the heart of People’s Freeway, and can take riders downtown in ten minutes and to the airport in 30 minutes. The neighborhood is also well-served by bus lines. Bikers will find flat terrain and some decent roads to use, but other roads are quite hazardous, so it’s best to steer clear. Of course, as the neighborhood’s name suggests, freeway access is no problem. Two major freeway entrances—at 1300 South and 2100 South—can instantly get you on your way to destinations all over the valley. One of the standout advantages of living in People’s Freeway is the wide selection of nearby stores. If you’ve got good weather and a little time on your hands, it’s no problem to walk to Target, Walmart, Costco, or Sam’s Club, all of which are located in the neighborhood. More specialized big box stores like Lowe’s, Home Depot, and Best Buy are also People’s Freeway landmarks. Fast food chains are a dime-a-dozen in the People’s Freeway neighborhood, but these city streets boast some fantastic local favorites as well. Penny Ann’s Cafe is an award-winning diner known for its delicious pies, stuffed french toast, and hotcakes. Penny Ann’s serves breakfast all day and has great lunch options, too. For a dinnertime destination, Copper Bowl offers traditional South Indian cuisine that Salt Lake residents go nuts over. If you want to make sure to get a table, their online reservation system is easy to use. Lucky 13 Bar and Grill boasts “cheap beer, good whiskey, house-smoked bacon, and gourmet burgers.” Is there a better combination? Located right next to Smith’s Ballpark, Lucky 13 is a great place to shoot pool, relax on the patio, and shoot the breeze with all your friends (assuming they’re 21 or older). Willie’s Lounge proudly claims the self-awarded title of “Utah’s finest dive,” offering cheap drinks, three karaoke nights every week, and a super-special Jenga table. For a swankier atmosphere, try the Gibson Lounge at the Grand America Hotel. The only school located in the People’s Freeway neighborhood is Challenger, a private school for kids in grades preK-8. Challenger has been around since 1960 and has various locations around the Salt Lake valley. As far as public schools go, students in People’s Freeway are in boundaries for Lincoln and Whittier elementary schools, Clayton and Hillside middle schools, and Highland High School. Parents who want different educational opportunities for their kids can check out local private schools, charter schools, and school choice transfer possibilities. Without question, the biggest drawback to living in the People’s Freeway neighborhood is dealing with the crime in the area. Being an urban area, Salt Lake City’s crime rate is already higher than the national average, and among SLC neighborhoods, People’s Freeway has a significant problem. According to the FBI’s uniform crime reports for 2014, the chance of being a victim of crime in People’s Freeway is 1 in 9. If you’re looking for fun spots in the People’s Freeway neighborhood, there are plenty of options. 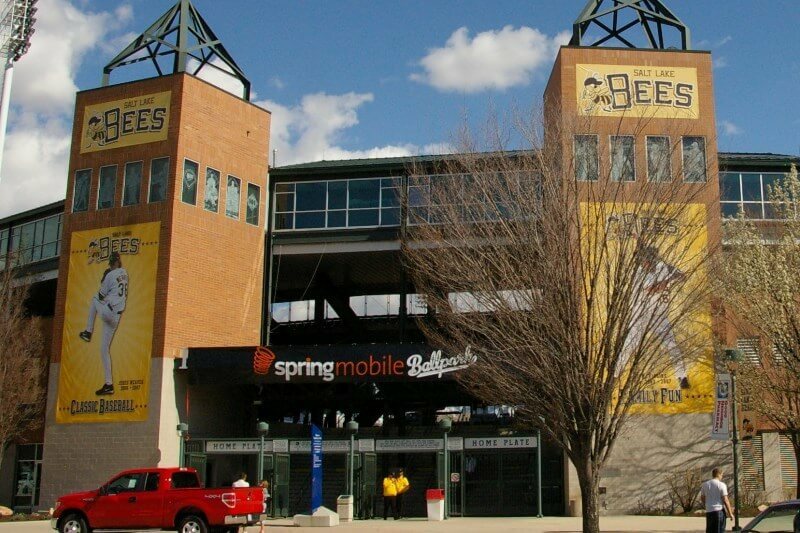 Foremost among them is Smith’s Ballpark, which hosts baseball games for Salt Lake City’s minor league team, the Bees, as well as for the University of Utah. The community loves to gather here for all kinds of special events, and the views can’t be beat. Locals can also check out Nightmare on 13th for haunted Halloween enjoyment, Chuck E. Cheese’s for kids’ parties, and Brewvies Cinema Pub for a night of film and craft beers. Park enthusiasts won’t find much in this neighborhood, but a short drive across the freeway will allow them to access a number of beautiful spots along the Jordan River Parkway. Heading east into the mountains is another great option; there are a number of nearby canyons that offer beautiful hikes and other outdoor recreation choices. With downtown events a short drive away and plenty of stores even closer, it’s easy to see the perks of living in People’s Freeway. Though housing options are limited and the crime rate is a huge deterrent, those who are looking for an affordable spot in the center of the action would do well to consider making the People’s Freeway neighborhood their home.